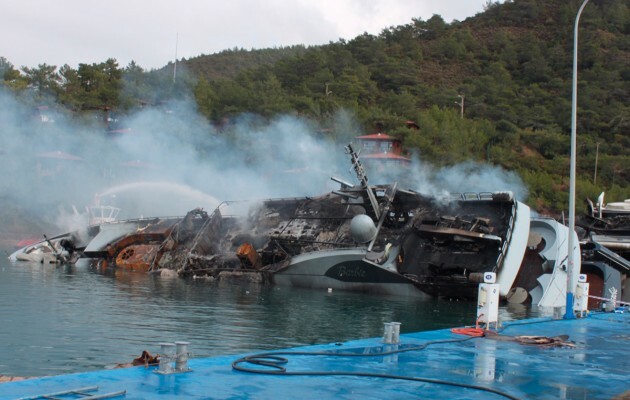 Motorboat & Yachting: The superyacht fire in Marmaris marina destroyed two vessels, and at least one of the owners got a considerable payout from Insurers. 2016 has quickly turning into the year of the superyacht fire, with major incidents in Abu Dhabi, Fethiye, Cowes and the US Virgin Islands, but for one lucky owner there is a silver lining. His superyacht Barbie was one of the two vessels that were completely gutted by the blaze at Marmaris marina in the morning hours of January 4 after flames spread from nearby superyacht 73m Lurssen The One. Now two months later, the Insurers Hiscox MGA of superyacht Barbie have confirmed that they have paid out $20 million (roughly £13.8 million) to the owner. “Barbie is the largest claim that the superyacht insurance market has had to deal with in quite some time”, said Paul Miller, director of underwriting at Hiscox, in a statement released this week. “That it was paid in full within 60 days of the event will hopefully help the owner to reach closure from this traumatic incident,” he added. The insurance policy of superyacht Barbie was purchased through Yachtsure24 and was underwritten by a syndicate of 14 insurers, including Lloyd’s of London. Whether the insurers can claim their costs from the owner of the other superyacht The One remains to be seen, as the cause of the Marmaris superyacht fire is still under investigation.